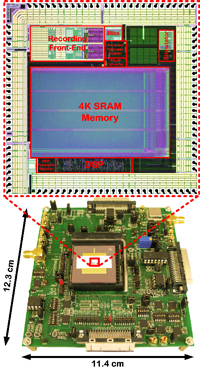 This project employs very-large-scale-integration (VLSI) design techniques in complementary metal-oxide-semiconductor (CMOS) technology to develop next-generation wireless, integrated microsystems for high-fidelity sensing and manipulation of brain neurochemistry. The project is conducted in collaboration with Prof. Paul Garris in the School of Biological Sciences at Illinois State University. We have previously developed the first miniaturized system for chemically resolved, wireless monitoring of dopamine in an ambulatory rat brain using fast-scan cyclic voltammetry (FSCV) at a carbon-fiber microelectrode (CFM). We are currently extending these passive chemical measurements to the realm of high-precision, dynamic, closed-loop control of neurochemistry by incorporating online signal-processing capabilities into our devices. 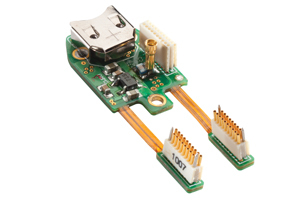 This project develops multichannel microsystems that can detect neural action potentials in one area of the cortex to drive microstimulation of another location in the central nervous system in real time. When combined with neurobiological tools, this work can remarkably advance the neurorehabilitation field at the level of functional neurons and networks. The project is conducted in collaboration with Prof. Randolph Nudo in the Department of Molecular and Integrative Physiology of Kansas University Medical Center. We have previously developed a miniaturized system capable of performing activity-dependent intracortical microstimulation (ICMS) in an ambulatory rat brain and have demonstrated for the first time the capability of this microdevice in facilitating rapid and substantial functional recovery after traumatic brain injury. Our current goal is to extend this approach to linking the cortex and spinal cord by artificially re-establishing lost corticostriatal communication pathways after a spinal cord injury (SCI). This project develops very-large-scale-integration (VLSI) implementation of a template-subtraction algorithm for stimulus artifact rejection (SAR) in real time with applicability to neural engineering scenarios in which electrophysiological recording and stimulation of the nervous system occur in close proximity. Short-latency neural activity has to be recorded from cortical regions of the brain without significant corruption or distortion by the stimulus artifact. Efforts to eliminate the stimulation artifact with conventional filters are typically not effective, because a significant overlap might exist between the spectral contents of the neural signal and the artifact. The SAR algorithm in this work is based upon an infinite impulse response (IIR) temporal filtering technique, which can be efficiently implemented in VLSI with reduced power consumption and silicon area. The project is conducted in collaboration with Prof. Hillel Chiel in the Biology Department of Case Western Reserve University. Recent advances in microfabrication and micro-electro-mechanical-system (MEMS) technologies have ushered in a new generation of high-site-density microelectrode arrays, enabling ensemble recording of single units and distributed recording of neurotransmitters in different brain regions concurrently. However, in comparison, technological advances in neural recording instruments for high-site-density measurements in small ambulatory animals have considerably lagged behind. 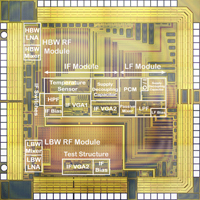 This project combines very-large-scale-integration (VLSI) design in complementary metal-oxide-semiconductor (CMOS) technology with ultra wideband signaling techniques to develop an energy-efficient transceiver for short-range, high-data-rate biotelemetry, which will be interfaced with our existing neurochemical-sensing devices for high-site-density brain monitoring. The project is conducted in collaboration with Prof. Dominique Durand in the Biomedical Engineering Department of Case Western Reserve University. This project aims to develop a miniaturized, autonomous, integrated measurement platform for complex dielectric permittivity measurement versus frequency (i.e., dielectric spectroscopy, or DS) in a broad frequency range from MHz to GHz. 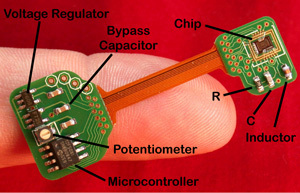 The platform comprises an RF/microwave, microfabricated, microfluidic sensor requiring only an S21 measurement for dielectric data extraction, and a sensor interface integrated circuit (IC) implementing a broadband frequency response analysis (bFRA) method to measure in the voltage domain the frequency-dependent transmission characteristics of the sensor loaded with a material-under-test (MUT). 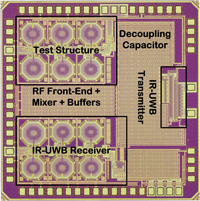 This work constitutes one of the first examples of fully miniaturized DS systems for conducting such measurements in MHz-to-GHz range with high accuracy using µL-sample volumes. The project is conducted in collaboration with Prof. Umut Gurkan in the Mechanical and Aerospace Engineering Department of Case Western Reserve University.